Working close with industry-leading brands, we supply a range of premium-quality 6 Panel Grained Doors at highly cost-effective rates. 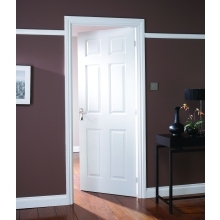 Competitively priced and available in a choice of several popular sizes, our high-quality doors make a stylish addition to a wide range of living and working environments. Select the most appropriate product for your project by browsing the range from here or search for specific products by using the search panel at the top of the page. Unable to find what you are looking for? Give your local branch a call now and our team will endeavour to accommodate your requirements. You can find your local branch here.